It is not uncommon for incompetent healthcare professionals to seek employment in the correctional system on the mistaken belief that standards are lower when dealing with inmate patients than the general public. Safeguards must be in place to prevent these individuals from entering the correctional healthcare field. Competent and appropriately credentialed care providers are the backbone of a safe health care delivery system. An essential element of risk management programs is the confirmation of credentials at the start of employment, followed by an initial evaluation of competence, and an ongoing program to develop competencies of all staff in the organization. Credentialing to evaluate the licensure and certification status of a potential staff member should be accomplished prior to hiring. Licensing acts as a safety net for the consumer. Because it is government-regulated, licensing is a legal requirement for many healthcare positions. Systems must be in place to ensure that practitioners have a free and unencumbered license to practice in the position and in the geographic location of the facility (usually the state). Professional boundaries of licensure differ among states but not among health care settings within jurisdictions; therefore, a physician unable to practice in a traditional setting would also be unqualified to practice in a correctional setting. Indeed, accreditation standards require that “the credential verification process includes inquiry regarding sanctions or disciplinary actions of state boards, employers, and the National Practitioner Data Bank (NPDB)” (NCCHC, 2014, p.39). Variability of licensure boundaries is most apparent for the LPN/LVN licensure. The types of responsibilities and functions allowable for practical nurses can be wildly different from one state to the next. This is an area of great concern in the correctional setting where limited budgets and oversight can lead to risky practices. As such, a careful review of state practice acts for all licensed staff is warranted. Employers have a responsibility to ensure that new staff members are competent to practice; therefore, employee orientation practices are a part of risk reduction efforts. An organized on-boarding process addressing the knowledge, skill, and attitude necessary for successful job performance ensures consistency and increases safety in care delivery. 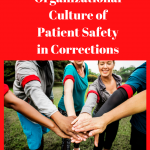 The orientation program should incorporate major risk concerns in correctional health care as well as those particular to the facility or program. For example, personal safety is a significant concern in the correctional setting. New employees must understand how to activate the facility safety mechanisms and how to be mindful of personal safety. The changing nature of correctional health care requires a process for ongoing competency development and evaluation, including peer review. This can be challenging in a small setting where there may be only one physician or nurse providing care. In this situation, an outside peer review process is necessary. County jails may be able to partner with the state prison system to accomplish a pool of peer-professionals to review clinical situations and documentation to determine competency. Ongoing competence development is needed when any clinical system is changed. Staff members must understand the reason for the change, the components of the new process, and their role in accomplishing the determined outcome. 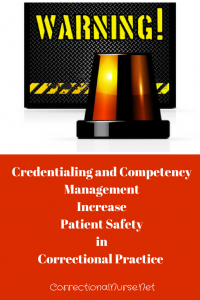 By mindfully attending to the credentialing, initial and ongoing competency of healthcare staff, correctional health systems reduce the risk of major medical errors while safeguarding their patient’s health. Staff ability to legally and practically perform their job functions is an important component of a correctional healthcare patient safety program. What is orientation like in your correctional setting? Share your thoughts about patient safety and staff training in the comments section of this post. Originally published in the Fall, 2016 of CorrectCare™, the quarterly magazine of the National Commission on Correctional Health Care. 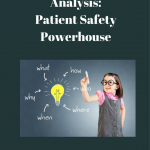 Read more about patient safety in correctional healthcare practice here. In addition to credentialing, a thorough job or position description that outlines the job parameters assists in a safe practicioner who knows boundries. Thanks For the topic. It is an important one. Great additions to our discussion, Gayle.